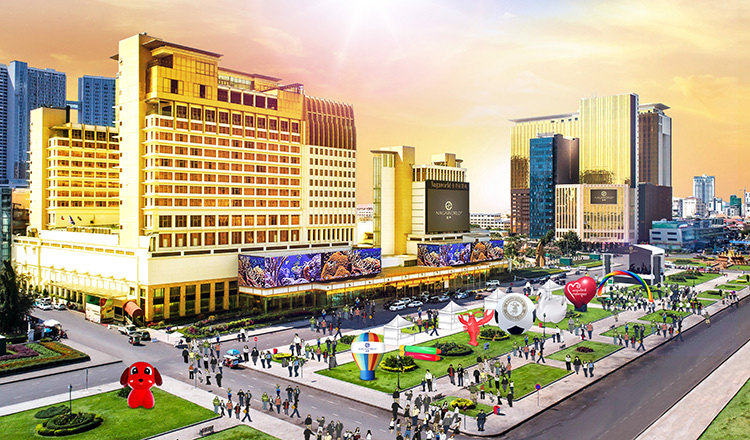 NagaWorld, in collaboration with City Hall, is organising the city’s first ever large scale outdoor concert to usher in the Khmer New Year. This unique outdoor event at Hun Sen Park is free for all to enjoy from today onwards, with the area living up to its reputation as the ‘Times Square of Phnom Penh’. Set in a joyous carnival-like atmosphere, the festive celebration promises a mesmerising experience for everyone with special decorations, cultural performances, fun activities and spectacular music parties featuring local celebrities. The event will be the perfect avenue for locals and tourists to come together to revel in the festivities and appreciate the culture, traditions and Khmer hospitality of Cambodia’s biggest annual festival. Enjoy Cambodian cultural performances at Hun Sen Park. A special lighting up ceremony this evening will officially launch the event, including spectacular high-energy performances featuring both cultural and international acts. Gigantic features and festive decorations will also be on display across the park, creating the ideal scene for photography with family and friends anytime throughout the event. These larger-than-life displays will be brightly illuminated with colourful lightings in the evening, including a huge dog structure marking the start of an auspicious Year of the Dog in the Khmer calendar, as well as other equally interesting features such as a Mekong lobster, swans, hot air balloons and more. An exciting line-up of special performances by popular local celebrities will be held during the weekend from 20 to 22 April, between 2pm till 11pm daily, along with traditional Apsara dancers, local and international bands, musicians and street performers. To be part of the festivities and fun galore, people from all walks of life, including tourists, just have to come over to Hun Sen Park early to secure the best spots to enjoy awesome music from Sokun Nisa, Khemarak Sereymun, Kmeng Khmer, Yuri, Pich Thai, G-Devith, Sovath Monivann, Sovath Monineak, Sovath Sereyvuth and more. In addition to the outdoor activities at Hun Sen Park, everyone is welcome to enjoy the NABA Entertainment Spectacular show at NABA Theatre, Naga2, showcasing dazzling live acts in Cambodia’s first 3D video mapping theatre from now till 15 April, 7:30pm daily. Admission is free for all.